Acest colier este extrem de delicat si feminin. Este realizat cu 3 trandafiri realizati manual din piele naturala (in nuante de albastru si auriu), accesorizati cu perle ivory Swarovski. Lantul este placat cu rodiu antiinnegrire. Este potrivit pentru orice ocazie. La comanda sunt si alte culori disponibile. Lungime ~ 65 cm. Florile au intre 4-4.5 cm diametru. This necklace is extremely feminine and delicate. It is made with handmade leather roses (blue and gold leather), embellished with ivory-cream Swarovski pearls and high quality rhodium plated chain. It is wonderful on any occasion. Other colors available.Size ~ 65 cmlong ;flowers diameter : 4-4.5 cm. Cercei candelabru realizati din 28 de cristale intr-o nuanta calda de verde-mar, extrem de eleganti. Cristalul in forma de octogon (8 mm) ofera un plus de stralucire datorita modului in care capteaza lumina. Sunt extrem de usori. Arata grozav cu o rochie neagra seara sau la o rochie vaporoasa in timpul zilei! Elemente argintate si placate cu rodiu.Colectia Go Green! Chandelier earrings made with 28 crystals in a warm shade of green apple, very elegant. Octagon-shaped crystal (8 mm) offers more brightness because of the way it captures light. Despite the large number of crystals, they are extremely light. They look great with a black evening dress or a hazy dress during the day! Collection Go Green! Colier vesel realizat din piele in nuante calde (alb, ciocolata, auriu) si vibrante ( oranj si verde), perfect pentru aceasta vara. Fiecare floare este taiata si prelucrata manual, fiind accesorizata cu cate un cristal Swarovski sau o margica din sticla. Se aseaza la baza gatului (baza colierului este din otel plastifiat). Unicat. 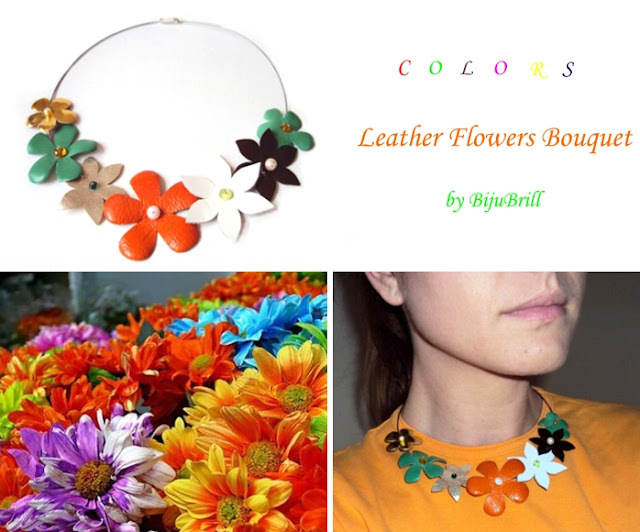 Beautiful and fun, this necklace is made out of leather in warm colors (white, chocolate, gold) and vibrant colors (deep orange, green, and brown). Each piece is hand cut and transformed into a feminine flower that will embellish your neck! Each one has a Swarovski crystal or a glass bead in the center that will bring more shine to the necklace. It is wonderful for this summer! One of a kind.